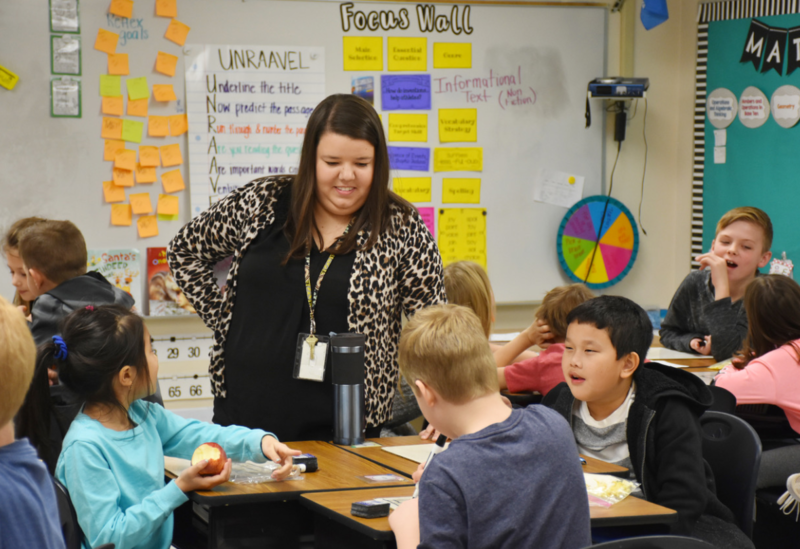 When it was time for Valley Elementary third grade teacher Molly Long to enroll in college, she flipped through the Oklahoma Baptist University college catalogues, glancing at the degree options. It was a perfunctory gesture. There was only one degree option for her, and had been only one since she was a child. Long, who was named Mustang Valley Elementary’s Teacher of the Year for 2017-2018, was called to teach. Long played “school” with her younger siblings and in each class of third graders, she finds a student or two like herself. Long got her start in the Oklahoma City district before moving to Mustang. She’s in her sixth year, each one in third grade. Her first year of teaching was not she was envisioned. After two years, Long moved to Mustang. She enjoys the continuity of the district where teachers typically finish May with the same students they had in August. Teaching math is her favorite. She infuses the lessons with hands-on activities. Her goal is to teach them to love it. She has one student who struggles with reading, but excels with math. Long said there is so much more to teaching than anyone knows before they are assigned their own class. Long is one of 14 site Teachers of the Year for Mustang Public Schools. The District Teacher of the Year will be announced in March.